Coffeeyay has built over 14 hours of comprehensive videos covering this new and highly profitable SNG format. Coffeeyay is well known for the #1 selling PT4 HUD, the CoffeeHUD, as well as the powerful HUSNG software CoffeeCalcs. In his long-standing role as head coach of the HUSNG.com staking program he took players from playing low stakes to beating the high stakes HUSNGs, and now he's using the skills he developed to help you beat Spin & Go poker. This unique 3-handed format requires a thorough understanding of position, the effects of stack depth, and solid game plans both pre-flop and post-flop. Coffeeyay has spent 100s of hours playing this game and developing this pack. He's broken Spin & Go strategy down to an easy to understand format based on the amount of players left in the hand and at the table, the position the player is in, and the previous pre-flop actions (such as button fold, SB raise, and BB call). This video pack is extremely detailed, beginning with general information about the format including essentials like understanding bankroll management. Both pre-flop and post-flop strategy is discussed for all situations: every position and action imaginable. It deals with large raise sizes, shoving ranges, post-flop play, raised pots, limped pots, 3-way pots, adjusting to the short stack at the table, and much more! Each section has PowerPoint slideshow videos to build understanding. Each concept video is paired with a practical video showing real hands, played by Coffeeyay himself, specifically illustrating that concept. To conclude the package, there is a series of live videos covering different stakes and demonstrating the strategy covered in the pack by applying it to full games. With hours of concept videos, live play, hand examples, range analysis, Nash game theory charts built for 3-way play, and more, this is the most complete high level package that you will find to help you take advantage of the popularity of this new and highly profitable poker format. Coffeeyay answers common questions asked about Spin and Gos and discusses the content and approach of the video pack. This video covers general information about the game. It includes understanding variance, detailed bankroll management and strategies, interpreting results and maximizing your hourly. This video focuses solely on the heads up portion of Spin and Gos. Guidelines are provided for preflop play at all stack sizes, in depth information on optimal shallow stacked push-fold play, and postflop information on how to construct your ranges in common situations. The video concludes with resources and techinques for further improvement to your heads up game. Covers the effects of being 3-handed on preflop strategy. Also included is detailed information on how to decide between folding, limping, minraising and open shoving deep stacked. There is discussion on facing all of the different 3-bet situations and understanding 3-handed preflop equities in a variety of situations. A game review analyzing a series of preflop decisions deep stacked on the button. Discusses your post flop strategy when your minraise is called. Individually examines each case - When the small blind calls and BB folds, when the SB folds and BB calls, and when both the SB and BB call with a special emphasis placed on understanding 3-way play. Analysis includes a series of button hands deep stacked where a minraise is called and the flop is seen, focusing on post flop decisions that arise. This video develops the idea of effective stacks for 3-handed play and the concept of symmetric stacks. Discusses adjustments to strategy for different symmetric effective stackd depths, including 3-handed Nash push/fold strategy. Ends with a detailed approach to adapting button strategy to asymmetric stacks, including adjustments to Nash push/fold ranges. This video puts all the button strategy video concepts together and reviews button hands, filtered for various shallow stack situations. It includes a discussion of pre and postflop play, as well as push fold decision making. Begins with preflop play heads up versus a button open, including information on 3-betting (both non all in and all in) and calling. Postflop play after calling is then discussed. Then discusses how to adjust your strategy to stack and depth sizes, as well as large opening sizes. Concludes with information on play versus a button limp. Hands are reviewed of BB playing versus button opens and limps. Includes detailed discussion of both preflop and postflop decision making. Begins with preflop play heads up versus a button open, including information on 3betting (both non all in and all in) and calling. Postflop play after calling is then discussed. Discussion continues on how to adjust your strategy to stack depth and large open sizes. Concludes with information on play versus a SB limp. Hands are reviewed of BB playing versus small blind opens and limps. Includes detailed discussion of both preflop and post flop decision making. Begins with preflop play 3-way versus button open, including information on 3-betting (both non all in and all in) and calling. Postflop play after calling is then discussed with a special emphasis placed on building an understanding of 3-way play postflop. Then a discussion on how to adjust strategies to stack depth and large open sizes. Concludes with information on play versus a button limp when small blind completes. Reviewing hands of BB play versus a button open when SB calls. Analyzes both preflop decision making and postflop decision making. Emphasis is placed on building an understanding of how to play postflop in 3-way pots. Comprehensive discussion of calling ranges versus open shoves 3 handed. Includes facing SB shoves when button open folds, button shoves when SB folds and 3-way shoves. Discusses both deep-stacked calling and shallow push/fold calling in all the cases. Discussion of the effects of asymmetric stacks on calling ranges in all possible situations are also included. Reviewing hands facing open shoves in BB. Discusses calling ranges in a variety of situations both deep and short stacked. Special emphasis on developing an understanding of population tendencies, application of Nash calling ranges and the effects of asymmetric stacks. Discussion of SB preflop play including comparisions of open folding, limping, minraising and open shoving. Postflop play when BB calls a minraise is examined. Ends with discussion of adjustments to shallow stack depths, including discussion of push/fold play. Hands reviewed for SB play when button open folds. Emphasis placed on understanding postflop play after your minraise is called. Discussion of SB preflop play comparing open folding, 3betting and calling as well as play versus BB 3-bets after calling. Postflop play after calling is discussed in both the case of HU and 3-way pots. Lastly, adjustments to our strategy versus large open sizes and when button limps are both discussed. Involves analysis with hands of preflop and postflop play from the small blind when the button opens. Discussion of SB calling range when button open shoves. Includes calling deep as well as using Nash push/fold calling ranges shallow. Adjusting to asymmetric stack situations is also discussed. Discussion of SB play facing button open shoves with hands being reviewed. Includes both deep and shallow stacks. Emphasis on understanding Nash calling ranges, proper adjustment to asymmetric situations and building reads on population tendencies. Coffeeyay plays the $5 buyin "million dollar" spin and go games, and discusses his actions while playing. Coffeeyay plays two games at the $15 level. Commentary is added after the game, allowing for more in depth discussions and analysis of various situations. Coffeeyay plays games at the $30 level and discusses his actions while playing. Includes discussion of play versus strong opponents. As a bonus, in addition to these videos, the Nash charts and slides from the videos are also included in the download as seperate files. Do you treat in detail 3 handed pop tendencies? I do a lot of work with population tendencies and how to exploit the population in the pack, however I don't provide any population frequencies. where can I find the nash charts in the download? Coffeeyay's chip graph has been added to the description. Let me know if there are any questions. The chip graph does NOT include rakeback value. Coffeeyay doesn't have 100% rakeback, he's not a PokerStars pro nor ever has been. I'd imagine he is a supernova level, which is probably something like 30-35% rakeback (can check via fpppro.com). Was just a joke, I couldn't see rakeback helping a chip graph unless he had more than 100% rakeback, but the graph looks good. I think you need around 30 chips pr tourney to break even pre rakeback and his looks like it is around 50, wich sounds very good. Haha, sorry, I see now what you meant. bankroll management?? shouldn't coffee mention about what's the bankroll we need for this type of the game?? 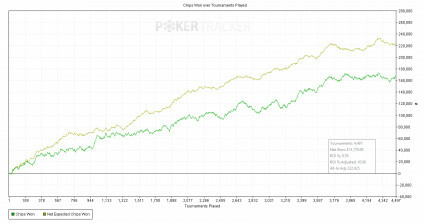 do we need less bankroll if we are pro with other form of poker?? I spend a good deal of time on bankroll management in the video "what you need to know" at the beginning of the pack. I discuss general practice of bankroll management and build detailed bankroll strategies together with rules for tuning them to your personal situation. It's hard to give a general rule which is why I go into so much depth and detail in the pack. I can barely see how many games were played on that graph. I assume 4700, is this correct? This would make approx 36.7 ev winrate, how many tables were you playing simulaneously? It's about 4.5k tournaments. It's mostly 6 tabling, but has some 4 tabling at the start. I'd like to see review&result by $15-$30HyperHU regular. Hi, are you asking for a review from a $15-30 buyin level hyper HUSNG regular? I just wanted to be sure this question wasn't for me. Thanks. that's right. Sorry I'm not good in English. In Practical BB facing shoves minute 5 I think you misread the hand completely. I tried to find this spot and found a situation with KTo facing a 3-way shove situation. I'm not sure what you mean about misreading the hand, I think my conclusions were valid there. Can you be more specific with your question? Thanks! I would call in that situation with hands like JTs QTs KJs only if I have reads that they are both loose aggressive fish. It's enough for one of them to have a tight range ( 14% for ex) to make those hands break even (if we take into account that the sng is over after this hand and we need 26 chips to overcome rake, it's -ev), and I think that happens a lot when people shove or call 25bb. I would use the nash 3way. I believe that with reads that it is a 2x multiplier you get reads that your opponents will have too wide get it in ranges. The population tendency is definitely to open shove too much and call shoves too wide so we should take this into account when playing readless. I think a big problem with the ranges you gave is that you included all of his strongest value hands (99+ AT+) wheras people tend to minraise or limp those fairly often compared to how often the open shove weaker Ax some Kx and low pocket pairs. That being said I agree at that stack depth it's somewhat close and KTs is a fold according to Nash 3-way. But I think for exploitive reasons it will be a call often, likely most of the time in a 2x multiplier and sometimes in higher ones as well where you have some reads on your opponents. Is this pack watchable on an Ipad? I do not believe that it is unfortunately. Spin and go is a very complex game and is made of 2 parts. 3-way play (when 3 people are on the table) and heads up play (2 people on the table). To be good at Spin and goes you will have to be good Heads-up player and good 3-way player. I checked my database (more than 6000 Spin and Go games played so far) and I have about 55% of hands heads-up and 45% of hands 3-way. According to this I believe that heads-up play is slightly more important for Spin and Goes than 3-way play. This pack focuses mostly on 3-way play. It explains in detail most of the situation you can get into when 3 people are on the table. Coffeeyay does all the math and explains what kind of ranges are good in BU, BB and SB. Pack also focuses on some population tendencies and gives suggestions for possible adjustments. Previously to playing Spin and goes I used to play heads up, so for me this pack is perfect, it tells me all I wanted to know about 3-way game and it will certainly help me improve my game and ROI. Is this pack worth $300? If you are heads up player this pack will help you understand differences between heads up and 3-way game. -If you are a losing player in Spin and Goes and you don't have experience playing heads up this pack is probably not the best choice for you right now. You will be better off spending $300 on some other packs (preferably Heads Up hyper) and improve your Heads up game first. After that you can buy this pack. As I said, I believe that Heads up knowledge is more important than 3-way game for Spin and goes. "If you want to win, you must not lose!" One thing that I really don't like in Practical Videos is that Coffeeyay doesn't know how to use filters in PT4 and spends lots of time searching through irrelevant hands. You're absolutely right that it is possible to do the filters correctly as I've figured out recently. My apologies for the mistake. In the past I used PT4 exclusively for HU purposes so I was still a novice when it came to multi-way play filters. Thanks for the feedback! I would love to get some insight on how to better filter in PT4 - similar to how Coffeeyay structures his videos. This is the question and answer that I posted in the PT4 forum. If you are aware of additional functionality, please let me know. Q: "Is there a way to configure a filter so that I can see hands with specific preflop action by position of opponents - e.g. Button folds, SB limps; Button open raises, SB flats, etc? Thank you!" A: "You can filter for the position of the active player as well as the position of the first raiser and some other options (e.g. 3 bettor+) via "More Filters -> Hand Details -> Player Position -> Player Position - Preflop" however it is not currently possible to use this filter for the position of any limpers in a hand." Pack is really good imo. Coffee really breaks down the spins to a simple to follow plan.. While the highest stakes are getting more competitive by the day this pack will put you in the right direction. Besides this and working on your HU game, im finding mental game material to be the most beneficial atm. Playing 3 handed for long periods of time and the added element of spin variance can be difficult to handle mentally. Can we get an ETA on the hud? Thank you both for providing all of that feedback. I think it will be very helpful to potential customers. I especially like the points about heads up play. If you've never played heads up, there is a primer in this pack, but you'll likely want to supplement that with heads up only packs (Coffeeyay has his own, zzztilt & phl500's crushing hypers pack is also a popular choice). Do you really think that those games can be beat?? Do you think that Coffee has beat those games playing 4-5K spins?? I mean, the whole bucle is 25k spins, and the evpricepool is gonna be $2.79 in the case of the $1. If we just count that the rake is extremely high, we need to win around 50evchips per spin just to be breakeven. Is not this game very conditioned to get the x25+ spins to have a nice winrate on them?? If we just take out the "big prices" x25+, the rake is gonna be around 10%, so thats mean that you must win at 55.55 evchips per spin for a 0% ROI, counting that the variance is extremely high as well, I am not really sure that those games can be beaten, and if it is possible, how many bucles of 25K spins do we need to do it??? For example in the Coffee graphs the the EV ROI is close to 0%, and in just 4-5K spins he got three jackpots, if those jackpots did not come, this graph is breakeven or even looser, so, I think the sample you need to be sure that they can be beaten has to be of at least 50-60k spins. I am agreed that the field is extremely poor on then, but the variance is just crazy, and I think because of that you need a longer term to get edge of your opponents, don´t you think the same?? The graphs for Coffeeyay's results are really blurry. Any chances of a reupload of ITM% and Avg Buyin. I haven't bought the pack but I already feel that the $300 price tag would be extremely hard to justify. Extrapolating from the chips won and tournaments played, Coffeeyay has a decent but not extraordinary winrate for the games, which I assume are at the $30's level. I can send you the original graph file if you'd like, just email me, membership@husng.com. As far as his results, they are good results. He isn't the biggest winning reg, nor would ever claim to be. He would claim to be an excellent coach, however. That is why the pack is $300. His results in HUSNGs are not as good as his Spin and Go results, and in HUSNGs, some of the best regs trying to get into the $100s, $200s, $300s and $500s pay him very good money to coach them. He is just very good at analyzing situations, building effective strategies and conveying winning information to players that helps them get better and make more money. I certainly realize that it is easier for someone with the very best graph to sell any product at a higher price, but we've always sold our products based on their quality at HUSNG.com. Mersenneary is another example. We had probably a dozen guys with better results than him making videos from time to time in our previous subscription system, but Mersenneary's were always the best, most effective and most in demand. Sorry about the crappy image quality. The games were all at the 30s, the highest buy-in offered at the time. They were multi-tabling, mostly 6-tabling. The all-in adjusted ITM is 36.64%, which leads to an EV ROI pre-rakeback of 4.42%, with rakeback that ends up being around 6.5% EV ROI. My skill set as a multi-tabling grinder is not nearly as good as my skill set as a strategist, planner, and explainer, so I definitely believe better results are possible. Even so these results, despite the relatively low stakes, give a very healthy EV hourly of around $100/hour, which I consider better than just "decent". That hourly 100$ EV is when you 6 tabling right? It would be 100/6= 16,6$ if you would play 1 table at a time. Is that correct? No, it will definitely be higher. As you add tables you don't get that many more games per hour and you also lose out on some ev roi. 1 tabling you'll have a higher roi, and you'll also get more games per hour than 1/6 the games you would get 6-tabling. I'd say you can definitely get in the $20-$30/hour 1-tabling if you get your game to be very solid. Hi,i started playing spin and go tours 4 months ago,my results are good,4k games at 7$ with 9% ev roi(80 chips per game) and 2k games at 15$ with 5.5 ev roi(55 chips per game),i clearly realized the soft level of these games from the first day.So,i found the sample videos interesting but i have to take a difficult decision. My initial intention was to buy a hyper hu package because i believed that improving my hu game more would improve my spin and go game too.In addition i am not very optimistic for the spin and go future,i believe that the level will be much more harder at the next months because regs will finally grind this format more heavily. So honestly what do you suggest?Also i have to mention that i can win the 15$ hu hyper but i dont know exactly my real roi. (1000 games 3% ev roi). 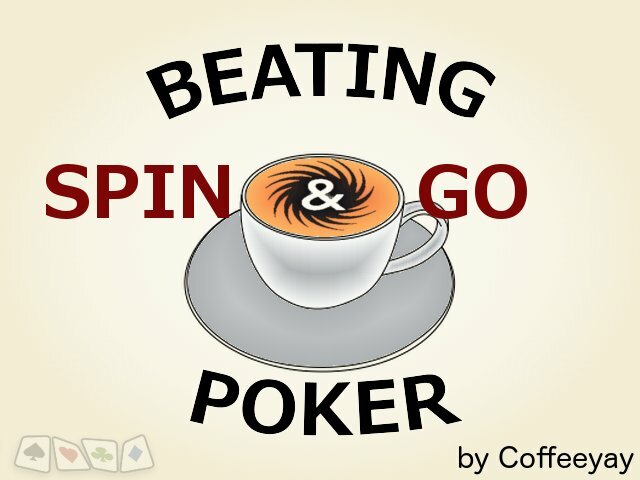 I saw that you offer free the spin and go package if someone take part to the staking spin and go program,can you give me some information about this program? Congrats on your results so far. - I would not assume Spins will get far tougher in the near future. People thought hyper HUSNGs would not be profitable, then they thought they would not be sustainable for long. We released tons of content ourselves, many new players got involved, we even released a really extensive free ebook by Mers, but the games kept getting more and more profitable for a few years and are still quite profitable to this day. That's not to say Spins will stay this profitable, but there's no real evidence for it getting more or less profitable I believe, so I would not assume it will go in either direction. - If you feel you are really good 3 handed, I would suggest a hu hyper package. If you feel you need more 3 handed instruction, I would really push you towards the Spins package, since it covers extensively 3 handed play (for 13-14 hours of the pack), and all the little details that a HUSNG regular would not likely recognize from the start that separate 3 handed play from 2 handed. - I'm having the staking manager email you personally to answer your questions. Players in the staking program get access to the packs on this site, as well as group and private coaching, tools (such as HUDs and software) and support for those tools (such as PT4 help and modifications). But he can explain in more detail for you. I know most people clearly do not have this problem because most people never mention it, But It´s a problem for me. And is that the video talk a lot using subjective words like ¨strong, weak, high¨ etc, which to mean mean very little and do not help me at all. I understand that this problem do not affect most people, so im mostly asking for help. For example in the BU preflop strategy there is a section where it talks about WEak hands, medium hands and strong hands. I do not know what those are, Is ATo a Strong hand or medium hand? what about A9o? KTo? Even then, it seems Coffe sugest to fold Hands like K8o, maaaybe, since its doesn´t have a strong kicker (or does it?) no conectivity, and no suitness. If i follow these guidelines i feel im gonna play super nit. I mean, it basically means folding hands like T9o maaybe, maybe 98o, K7o, J7o. Q7s. It seems a very nit opening on the button, and im confused what to do, I´m open those readless all the time, im being to loose? I don´t know it seems like it based on coffee recommendations. I used to play A lot of cash games and those were instant opening to me, maybe in spin and go i should be considerable more tight? I don´t know. It´s possible that Im leaking money by having a too loose range, but if im or not, at the BU portion do not seem to answer., and is the kind of thing that I expect to be answered. Great questions! Let's tackle the two most important things you asked about. First, better defining what "weak, medium and strong" mean, particularly in terms of kickers and pair strength. Second, thinking about our VPIP on the BU in spins. For the first question, it boils down to defining cutoff hands for certain ranges and unfortunately the common answer holds: it depends. It depends on the table, it depends on reads, it depends even on the multiplier and stakes and general population tendencies. Because spins are in their infancy I didn't want to define specific cutoffs because they likely won't hold in many situaitions. To get precise answers you'll have to explore your population tendencies and poker theory some more to get really good answers. However, I can give you some general guidelines to make things more practical. So for Ax, AQ+ is always a strong kicker, AT-AJ is sometimes strong sometimes medium, A8-A9 are almost always medium, A7 is sometimes medium sometimes weak, and A6-A2 are always weak (with A5 and A6 being tied for best of these). This ranking will hold fairly well for other pairs, though as pairs get weaker kicker becomes more important so in general you can't get away with calling "sometimes strong" hands strong as often. As far as how strong pairs are, again a similiar ranking is good--Ax Kx are always strong top pairs, Qx Jx will usually be strong but sometimes medium (Qx usually strong, Jx usually medium), and 8-T tend to be medium pairs. Again, this will depend strongly on villain starting ranges, number of players in the pot, relative position, reads, and other factors. As for button VPIP, I do think that in general starting ranges in the BU in spin and gos should lean towards being quite nitty. The BU is playing purely for value since they have no forced investment, and in general games play quite loose and aggressive with small stacks behind post so there's not a ton of room to leverage fold equity or post flop play (though this will vary with table/reads). Compared to a cash game we have to be tighter because 3b (and especially 3b shove) ranges are wider and post flop edge is smaller. So K8o is in my book too weak most of the time, its resulting hands are mostly pairs of kings with 8 kickers (which will usually be K with a medium/weak kicker) and pairs of 8s with a good kicker (but pairs of 8s are on the low end of medium pairs). I definitely believe that playing too loose a range on the button is leaking money in many situations. For what it's worth, this is something you can fairly easily check in PT4--just look up hands from the bottom of your button range and see your adj bb/100. Anything less than 0bb/100 in the BU indicates that the hands may be better folded, how strongly it indicates it depends on the width of your hand rane and the sample size you're looking at. Hi, thanks a lot for the answer, it was definitly the kind of answer I was looking for. Interesting I decided to open K2 to K8o in the button before this answer, and I have a sample of 2xxx games, Right now I´m a winning player at both 15 and 30s at itm adjusted 38% in 15 and 36,5% in 30s, and despite that, I was surprised with how many hands I was losing money, I was in fact losing money so far with K2o to K8o, with K9o is right now positive. More surprising I´m losing money with Kxs up to K6s, which really shocked me, losing money also with Q7s and below and J6s, T5s. Honestly I would keep playing them so far (specially Kxs) because sample is low and I maybe also im playing wrong, but the current results + Your advice make me decide to cut them off my range for now, I think though , there must be situations where playing those borderline hands is ok.
An obvius example is having passive people on the blinds, the problem is that most regs are not passive, and by the time we can get any decent information from recreational players, we are playing a lot shallower than that, so i find hard to find a spots where suddenly raising lighter is ok. However, and I know you avoided to talk about this on the videos, i think there may be spots we may find where openlimping hands like Q5s K5s, And maybe J8 or 97o may be better than openfolding, but im not sure how to find those spots or how to modify my range to include that, but it really feels so bad to me to fold such hands when i have position. I do have other questions and I did post them on the members forum, you can answer me here, if you prefer so. I've yet to find a player who has been profitable with low off suit kings, so I'm firmly in the camp that they are clear folds (and K9o is pretty close). The suited kings are definitely close but I could see them not being profitable, especially the low ones. Your results with them though will be much more sample size dependent though--you always get 1/3 the sample of off suit hands--so you need to be very careful drawing conclusions about them. This video pack is very good it will improve your game a lot, if you haven't yet, buy it now!! I recommend! I thought I would throw my 2 cents in regarding the video pack. I bought it a while back but didn't want to leave a review until I had re-watched it a couple of times and taken all of the information in. For people who are new to Spins, this pack will be a revelation; particularly the 'What You Need To Know' video which outlines BRM and possible win-rates. The first video makes very clear how sickening the downswings can be and how going busto is a very real concern - variance is something that players who are transitioning from rec to reg struggle most with (I know I did), but it is largely ignored in many video packs as most regs eventually come to realise that it is a necessary evil and can indeed work both ways. The advice in that video is useful for players of every poker variant but is absolutely essential for prospective Spin & Go players... Losing $500+ at $30+ levels in an hour is quite an easy feat in these games (as is winning that and of course more) and I feel this particular video did a good job of reiterating that. Strategy-wise; the pack is excellent for beginners without doubt. I remember watching videos on this site when I was playing micro-stakes HUSNGs and admittedly I found a lot of the content difficult to understand; sometimes because it was communicated poorly but sometimes because it was too complicated. Overall the pack is absolutely accessible to learners and I feel that Coffeeyay concisely communicates a great number of important concepts in a manner that is both easy to understand and backed up by statistical data as opposed to anecdotes. There are some small exceptions where absolute beginners may have some difficulty but will likely find useful as they progress. Despite being easy to understand and at times simple, there is ample useful information for solid regulars to glean - particularly the 3-handed aspect of the game which does not come as naturally as one might think. The 3-handed material was the most important part of the pack for me being a former HUSNG player. I had struggled to construct ranges at all depths as spins do differ greatly from HUSNG play. End-game in particular can be tricky in spins as push/fold becomes a very complicated matter. Coffeeyay has managed to mostly solve this problem in the pack with an explanation of S1/S2 (symmetric and asymmetric stacks) which, in layman's terms, describes how to play short-stacked depending on the position of the shortest stack and biggest stack(s). It is something that before the pack I had wondered about and struggled with but was completely incapable of solving it. This pack will teach you not only how to understand the concept of symmetric stacks but will teach you how to adapt to them and even gives you a number of Nash charts detailing the hands you should be pushing and (this is crucial) folding. If you are like myself and do not excel at solving poker problems, you will benefit greatly from these videos. In conclusion; the pack is useful for everyone: people new to HU and/or spins will benefit greatly from this pack; it truly is the most informative and exhaustive spin resource available. If you do buy it, I would strongly recommend watching it more than once and maybe not all in one viewing, as the vast amount of information can be difficult to take in quickly. The pack also comes with a copy of all the slides and charts which are absolutely worth looking over frequently. Gl! I think the pack is good for HUSNG players that want to transit to spin and gos. But someone unexperienced with HUSNG will find the pack pretty incomplete. I will note that at least in my expeirence absorbing this information is good to crush current 15s and maybe do well in 30s, but as Im trying to move to 60s i realize i need something more that im not sure about. I think what I learned from these videos is not enough to beat 60s and I don´t know where to go next. BB vs SB becomes a very important part of the game 3way at this stakes imo as 3 way last longer and BB are very quick to flat your minraises or 3bet them, and I do not feel I have the tools to do well. Also im noticing some regs at this stakes limp at the button and even more at the SB (There is even a coach from this site that i wont mention that has a surprisingly high rate of limps at these positions), and the videos do not profundize on that (though they mention it as a possiblity) and i wonder if maybe i should incorporate limping, but in either case i won´t find how in these videos. The reason is that while the basics are good, the video indulges quite a bit on population tendencies that i found true in 7s and 15s, barely true in 30s, but almost non existent in 60s. I personally do not have the tools to deal with the population tendencies of 60s and I don´t think these video help me to find how to beat them. The HU portion is intentionally left to be pretty light--there's so much available material on HUSNG so I believe that spending a lot of the pack discussing it would have been a waste. The video packs offered on husng.com are very high quality and are definitely a great place to supplement the Spin pack. Unfortunately with a topic as large as Spin and Gos I had to spend less time on something and HU was the best choice. As for higher stakes, $60s are currently the highest stakes offered. There is no way I, or anyone else for that matter, could create a video pack that would let you beat the highest stakes of a format. It's just not a reasonable goal or expectation. No training material is going to guarantee you to be a winner or give you the tools to beat high stakes by itself--that takes a lot of time, dedication, and outside study. In the end poker is a very complex game and it is an unreasonable expectation to expect to beat the highest stakes with simply a video pack at your side. Lastly regarding population tendencies, I've spent a fair amount of time since the video pack's release studying the population tendencies at the different stakes. I strongly believe the overall style of play is very similar at the 60s as what I describe in the video pack. Yes there is a lower amount of spewing, and players have tighter call open shove ranges, but general tendencies and frequencies in both 3-handed and HU play at the 60s are incredibly close to the data I used in the pack from the 30s. I think often our brain plays tricks on us when we change stakes or sites and emphasizes small differences and small sample bias--it often takes big picture analysis to find that actually things on average are very similar. Lastly regarding limping, as I mention earlier it's definitely a very important topic to develop a more advanced gamplan. I will work on creating content to go into more detail regarding limping in Spin and Gos and other advanced topics, but I still hold that in most situations (and especially at lower stakes) the ev difference gained from opening up a limping range is generally very small and that on average limping and minraising, particularly readless, have very similar expectation values. I have simple question for hyperHU players. Did you increase winrate by switch to spingo? Some have and some have not. You can see it best by the data posted on 2p2 from that anonymous dataminer guy that showed that about half the regs are playing hyper HUSNGs as before (and they are playing it at around the same profit). So about half the regs left to play spins, and presumably are doing better or feel they will be soon. Also, you see plenty of $100-200 HUSNG players playing $30s and $60s spins. I'd say that Spins are currently looking very profitable, but nobody knows what the future will hold. Being good at both 2 handed and 3 handed poker seems to be a good strategy right now, to set yourself up for the most profit this year (and likely next). How do you calculate adjusted EV ROI once you have your adjusted itm EV ? Hi guys. I'm an average 500nl zoom reg and consider transitioning to spins. And I have couple questions about it. How hard is it to maintain 5% roi at 60s? Do you know someone with higher results? How many games should I play to have a pretty precise estimation of my allin adjusted ITM? People definitely have better results, but like hyper HUSNGs, the "best" are the best, it's not going to be easy or attainable for everyone. Games wise, at least a few thousand.